Get this week sale and online promo codes, available in-store or online. 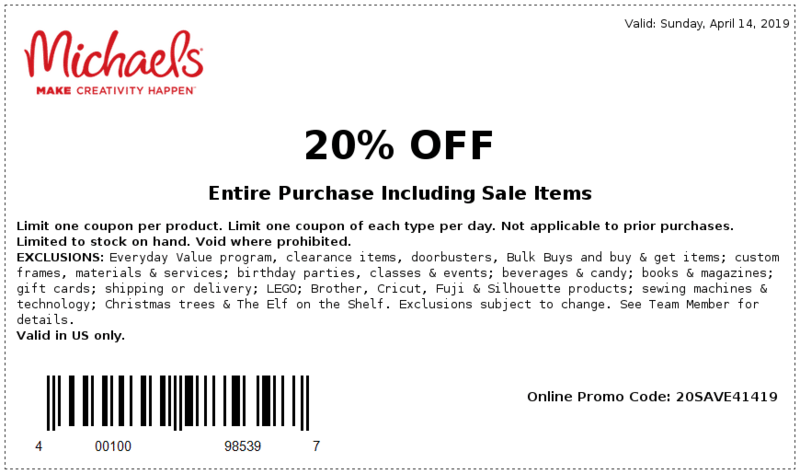 Here are the Michaels Coupons – 20% OFF Entire Purchase Including Sale Items – valid through Sunday, April 14, 2019. Use Promo Code: 20SAVE41419. View Michaels Weekly Ad for this week. Limit one coupons per product. Limit one coupon of each type per day, and to stock on hand. Some exclusions apply and are subject to change. Due to the seasonal nature of products, quantities may be limited and there may be no rain checks issued. The retailer reserves the right to limit quantities. Take 20% OFF Entire Purchase Including Sale Items in your online or buy online pick up in store order. Use Promo Code: 20SAVE41419. Expires: 4/14/19. Exclusions apply. Limit one coupon of each type per transaction per day. Product availability and store hours may vary. Take 20% OFF Special Teacher Event. Offer valid Saturday, March 23, 2019 from 1pm to 3pm. Did you know Michaels lets you use multiple coupons per the same purchase if the coupons are different types? You can use their infamous 25% off entire purchase along with another coupon, i.e. 50% off one regularly priced item, except the 25% coupon won’t apply to the item already discounted.